I love egg rolls. Did you know that you can bake them? You can get that same crunchy texture without deep frying your pretty vegetables into fatty oblivion. 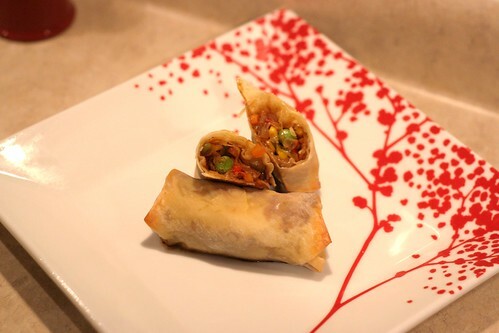 These egg rolls are crunchy with the savory flavor of soy sauce and a slight spice from chili powder. A perfect balance. Even my Dad loved them, and he doesn't like to step out of the box with it comes to food. This is one of those "I want to use every leftover vegetable in my fridge to get rid of it" kind of thing. I saw parts of bell pepper, half an onion, baggies of frozen peas and corn... why not throw it all together and shove it in an egg roll? Win. 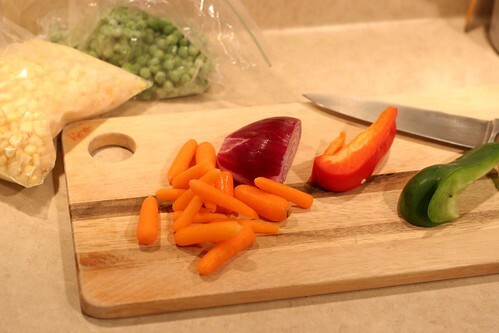 I chopped up all my veggies into really small pieces. I didn't want big chunks in my egg rolls. After the vegetables get soft, add chili powder, turmeric, shredded cabbage, soy sauce, salt and pepper. After a few minutes of stirring and cooking - you've got egg roll filling! Set up your work station with the egg rolls, a lined baking sheet and some water. Place the egg roll wrapper down in front of you like a triangle, then put 1/4 cup or so of filling in the center of the triangle. 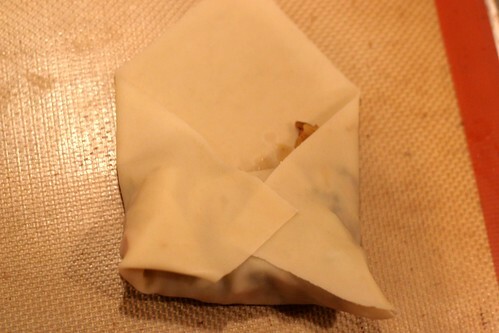 Then fold the bottom corner up over the filling, fold in both corners and moisten the top corner with some water. Then you just roll it up and line your little beauties on a baking sheet. To get a nice crunch, I sprayed the tops with olive oil spray before baking them. When they come out of the oven, they are crispy and delicious. I made these as a side dish to this killer steak I made on Tuesday night. 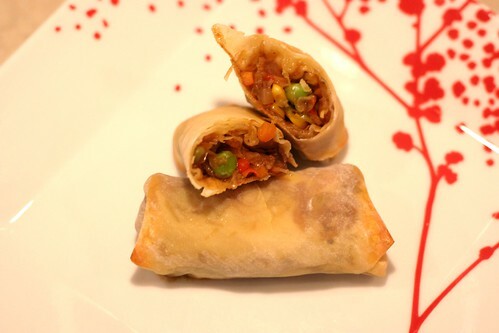 But these vegetable egg rolls would be great as an appetizer. I think I will make some more for the Super Bowl this weekend. Preheat oven to 350 degrees. Line a baking sheet and set aside. 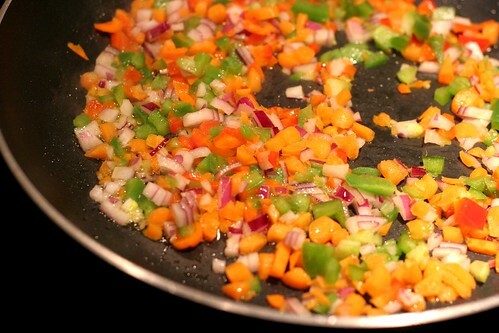 Combine oil and bell pepper, onion and carrot in a large skillet over medium heat. Stir and let cook for 5 - 7 minutes, or until tender. Add frozen corn and peas. Let warm through for a few minutes. Add spices and shredded cabbage. 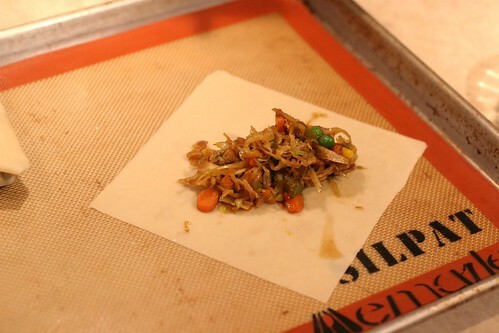 While the cabbage wilts, set up your egg roll station with the wrappers, a small bowl of water and the baking sheet. Add soy sauce to vegetable mixture and stir. Cook for 3-4 more minutes then remove from heat. Place the egg roll wrapper down in front of you like a triangle, then put 1/4 cup (or less) of filling in the center of the triangle. Fold the bottom corner up over the filling, fold in both corners and moisten the top corner with some water. 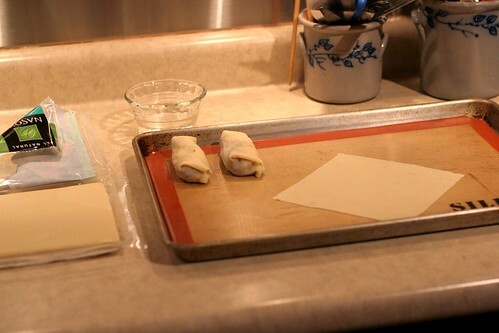 Roll up the egg roll and place on the baking sheet. Repeat until the vegetable mixture is gone. Line the egg rolls on the baking sheet and spray liberally with olive oil cooking spray. Bake for 12-15 minutes or until egg rolls are browned on top. beautiful job with the baked egg rolls! i'm all about healthier options! My mouth fell. Drooled maybe. I double clicked on the picture. I fell off my chair (kinda). I called my friend who lives two miles away. I ordered her to look at your post. And come to my house with some egg roll wrappers.